Researchers at Kanazawa University report in Cell Stem Cell how the Spred1 molecule is involved in hematopoietic stem cell self-renewal. 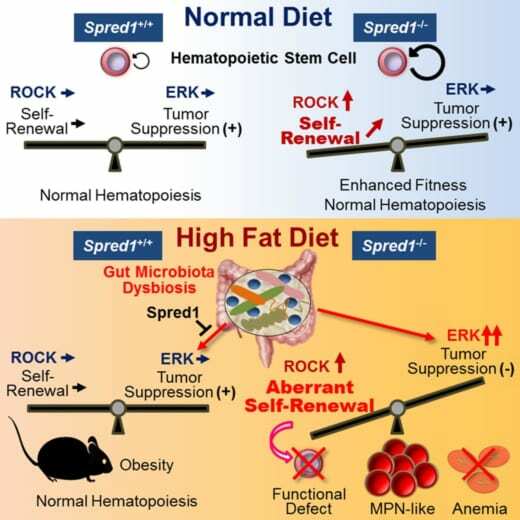 Experiments with mouse models show that under normal conditions, Spred1 acts as a negative regulator, while under diet-induced stress, it protects hematopoietic homeostasis. The production of blood cells is regulated by so-called hematopoietic stem cells (HSCs), which reside in bone marrow. It is known that under certain stress conditions, such as aging or inflammation, the HSCs’ self-renewal capacity — a key property of stem cells — decreases. Now, a team of researchers led by Yuko Tadokoro and Atsushi Hirao from Kanazawa University have studied the role played by a molecule called Spred1 in the homeostasis (equilibrated self-renewal) of HSCs. Their main finding is that Spred1 safeguards HSC homeostasis in mice subjected to a high-fat diet. Legius syndrome is a condition resulting from mutations of the Spred1 gene; symptoms include freckles, learning disabilities and attention-deficit hyperactivity disorder (ADHD). It is often confused with neurofibromatosis type I (NF-1). In the latter, tumor growths are common, whereas in Legius syndrome they are absent. Tadokoro and Hirao investigated the connection between Spred1 deficiency and Legius syndrome and found that Spred1 does not play the role of a conventional tumor suppressor.